James Horan: "We were a yard off everything [in the first half]." 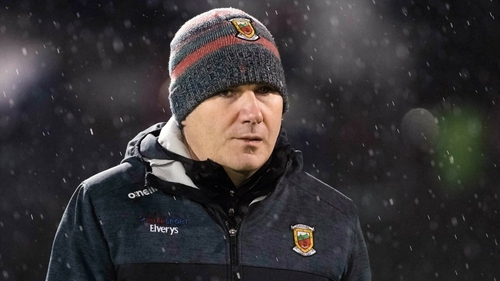 James Horan said Mayo are still doing "daft" things as the new boss looks to finetune his side further despite boasting perfect league record. Mayo had too much for Cavan at MacHale Park on Saturday night, closing out a 1-13 to 0-11 win that earned a third win from three Division 1 outings. Top of the table and looking good, but Horan was irked by some springtime sloppiness. "We were a yard off everything [in the first half]; a yard off with our tackling, our runs, and Cavan started well," he told RTÉ Sport's John Kenny. "They had a lot of people running from defence - they caught us out a good bit. "We got to grips with it pretty well. We were probably a bit lucky with Evan Regan's goal, a mishit shot that he followed in. In the second half we'd a lot of possession, made an awful lot of mistakes, but we kept working hard and trying to do the right thing. We got through it in the end." "There was a ten, 15-minute period in the second half where we just kept on giving away the ball. We did a lot of good things and a lot of daft things that we'll work on." Cavan manager Mickey Graham was a little frustrated that Mayo's goal stood - Regan looked like he'd fouled keeper Raymond Galligan - but overall he had no complaints. "We know we still have a lot of work to do on the training ground... areas we need to work on," he said. "At least we know what we are. We gave far too much ball away.You get punished at this level. The lads are learning very quickly about that. That's the nature of the beast; that's Division 1 football."